Next week we say goodbye to the Manuscript pen and hello to the pen for August. 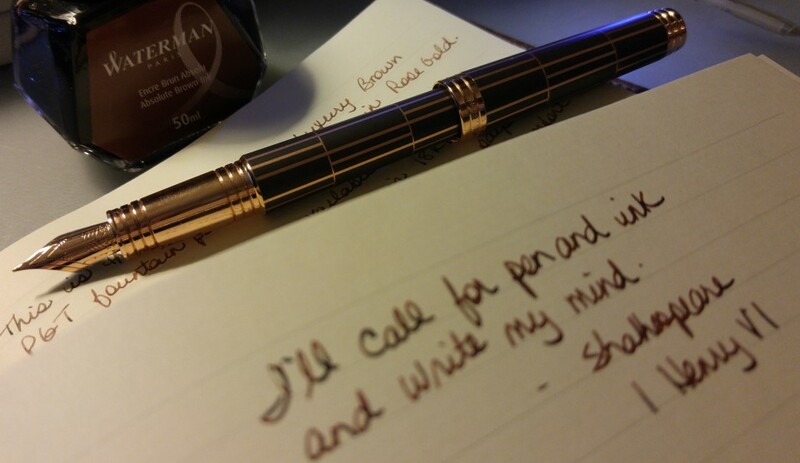 I’ve really enjoyed using the Manuscript pen these last few weeks. But something new to look forward to is always nice! Purchases: In a moment of weakness I made a purchase from Wonderpens. Review to come when it gets here. I think I will have enough points for a $100 voucher from the World Mail Panel Surveys next month, so then the guilt free spending spree can begin! Who am I kidding? There’s only one point covered this past week: my niece’s wedding. It was a beautiful weekend with so many amazing moments, most of which are personal, and will not be shared here. But it was a time of celebration and also of reflection, as I was moved to tears many times during the weekend, as I reflected on the bride and her sister and their journey so far. I also reflected on my own journey, the highs and the lows. There will be more of this next week – I’m barely halfway through the wedding!